Our product range includes a wide range of differential gauges, low pressure diaphragm gauges and thermo pressure gauges. 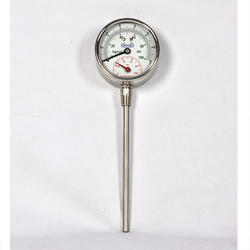 Being a client centric organization, we are engaged in offering a wide range of Differential Gauges. All the products offered by us are manufactured using optimum-grade raw material which is procured from the certified vendors of the market. Our offered range is widely used for measuring pressure difference of two different ports and indicate the pressure difference on the dial. These product is featured with a single diaphragm which senses the pressure and transmits, made available in varied custom-built models. 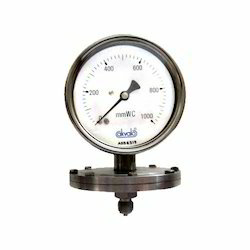 gauge Sizes 2-1/2" and 4"
Our clients can avail from us a wide range of Low Pressure Diaphragm Gauges. This range of the gauges is manufactured using high-grade raw material sourced from the trustworthy vendors of the market. These products are widely used for measuring commercial heating, dry and gaseous media, level measurement, gases distribution and filtration system. Clients from various parts of the region widely appreciate our offered range of the products for its following listed.